Oh, the bad girl is so bad. She is a character to hate, indeed. Though I have to say, even though this book is filled with characters that don't really lend well to sympathy, I have to say this is a marvelous book, which I enjoyed reading up to the very end. 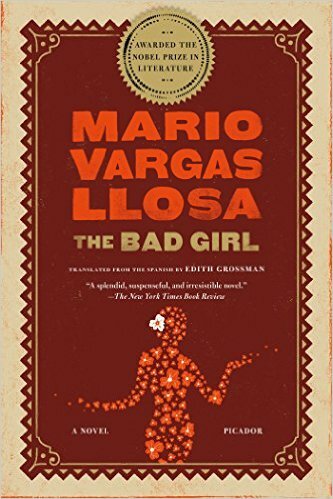 See, this is the fifth book written by Mario Vargas Llosa which I have read. Sometimes, I find his books not too engaging, such as Death in the Andes, Who Killed Palomino Molero?, or The Green House. But then again, there are exceptions, such as The War of the End of the World, which I found immensely captivating. So I am not giving up on Vargas Llosa yet, he'll still be an author that will get first dibs whenever I am looking for something new to read. And this time, I am glad that I picked up this book. This book is about the story of Ricardito Somocurcio, a Peruvian lad in the Miraflores neighborhood of Lima. He's 15, and together with his friends, he gets to know Lily, a new girl in town, who claims to be Chilean. Except it seems more likely than not that she isn't. When somehow, her deceit is found out, she disappears from the neighborhood. But before she disappeared, she managed to captivate Ricardito's heart, who falls head over heels having a crush on Lily. Ricardo grows up. 10 years later, we find Ricardito in Paris. He's a student, involved with the Communist movement, but not really wholeheartedly into it. He meets Comrade Arlette, a Peruvian who has arrived in Paris on a Communist scholarship. Ricardito thinks that Comrade Arlette is Lily from 10 years ago, but she never admits it. They fall in love, but because of circumstances, Comrade Arlette goes away and gets sent to Cuba; Paris was just a staging point. Later on, we get to know that Arlette became a lover of a Communist leader in Cuba, and Ricardito is heartbroken as his love throws him away like garbage. This scene will happen over and over again. Ricardito keeps running into Lily, into Comrade Arlette, into Madame Arnoux, into Mrs. Richardson, into Kuriko, and so on. The sad thing is that every time Ricardito the good boy sees the bad girl, he falls in love, whether he's young or old, he falls in love, only to be thrown aside, heartbroken, when the bad girl finally finds another guy who will provide her with money, and an escape from the relatively predictable and sanitary life that Ricardito leads. Ricardito, in effect, is like the mythological Prometheus, whose liver gets eaten every night. Ricardito's heart gets broken every few years, every time he meets the bad girl, yet for some reason, up to the very end, his heart regenerates, and is able to love again, to love the bad girl even though he surely knows that she's gonna get up and dash out the door the moment a more exciting man comes along. The funny thing is, there isn't a character here that I could relate to. After all, for an INTJ like me, these characters don't make sense. I wish I could hit Ricardito in the head in order to get some sense in him, so that he would realize that he should fall in love with someone else, instead of the bad girl. He tried doing that once, but in the end, it failed. And I have no sympathy for the bad girl either. There are limits, boundaries that one shouldn't cross, and I think she just crossed so many of these, that I could not imagine myself forgiving her if I were in Ricardito's place. But then again I am not Ricardito. Ricardito feels, I think. Ricardito is driven by his heart, not his brain. And I admit, there's nothing wrong with that. That's just not me. And I guess if I had a very good friend like him, then I will stand by his side as much as I can, even though I see that he might be needing an intervention. I think the amazing thing here is that I ended up liking this book, even though the characters aren't likable at all. It shows human nature, so to speak. It illustrates how various competing life constraints can lead to difficult and tough life choices. It shows the complexity of the human condition, I guess, it shows a side of humanity, that is very real, no matter how ugly or disgusted we might be to the point that we deny it. I have to say, that I am glad I am not wired like this. That being said, I also know that my system isn't perfect. This is perhaps one of the better books from Vargas Llosa I have read. I wholeheartedly recommend it. The interesting thing is that it is almost predictable. One already knows that history will repeat itself, and Ricardito's heart will be broken in every subsequent chapter. Every chapter pretty much is a mirror image of the previous one: there's always a companion, a mediator, a minor character that acts as a bridge from Ricardito to the bad girl, and when the chapter finishes, when the bad girl moves on, the minor character fades away, and the narrative time moves forward. Nevertheless, I would say this book is a page turner, and I turned the page enthusiastically, even though I already know what will happen next. Vargas Llosa picked the right theme to captivate his audience. Overall, this book is amazing. I give it 5 out of 5 stars.